The fifth edition of AFRIKAMERA – CONTEMPORARY AFRICAN CINEMA (13-18 November 2012) the non-profit cultural charity toucouleur e.V. presents a selection of contemporary feature and documentary films from the new generation of "African women on and behind the screen". The festival opens 13 November, with Sur la planche (On the Edge), the feature film debut of Moroccan director Leila Kilani (Morocco, France, Germany 2011). Othelo Burning (South Africa 2012) is South African filmmaker Sara Blecher's debut movie, 14 Nov.
Indochine sur les traces de ma mere (Indochina, Traces of a Mother, France, Benin, Vietnam 2010) by Idrissou Mora Kpai, 14 Nov.
MOZAMBIQUE SHORTS (15 Nov) builds on the tradition from previous years, introducing film milieus from hitherto less known African states. Mozambican director and producer Mario Mickey Fonseca presents a program consisting of four short and medium length films. Imani (Uganda, Sweden 2010) by Caroline Kamya, 15 Nov.
Pumzi by Wanuri Kahiu (Kenya 2010), 22 min. L’Ambouba by Nadia Rais (Tunesia 2009), 9 min. Yasmine et la révolution by Karin Albou (Algeria/France 2011), 8 min. La femme invisible (The invisible woman) by Pascale Obolo (Cameroon/France 2008), 8 min. L’Mrayet by Nadia Rais (Tunisia 2012), 12 min. Mon beau sourire (My Beautiful Smile) by Angèle Diabang (Senegal 2005), 5 min. Tout le monde a des raisons d‘en vouloir à sa mère (Everyone has reasons to be angry with their mother) by Pauline Mulombe (the Democratic Republic of Congo 2009), 10 min. Saturday (17 Nov) begins with a high-level panel discussion of the theme FEMALE SCREENS – WOMEN FILMMAKERS IN AFRICA, looking closer at the realities and perspectives of women filmmakers in the African film and creative industries. In cooperation with Deutschen Gesellschaft für Internationale Zusammenarbeit (GIZ). 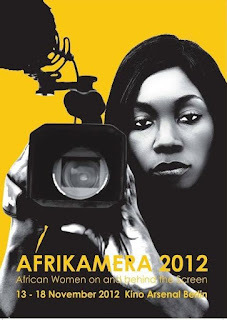 The closing event of AFRIKAMERA is Une femme pas comme les autres (An uncommon woman, Burkina Faso 2008) by Abdoulaye Dao. Lead character, Georgette Paré, will attend the screening, 18 Nov. The WORKSHOP "WEDDING ! AFRIKANISCHE SPURENSUCHE“, will take place parallel to the festival with Angèle Diabang.